Whether soy complex prices rally further, or fall substantially, will be solely a function of South American weather through the end of February, perhaps even through the first half of March. 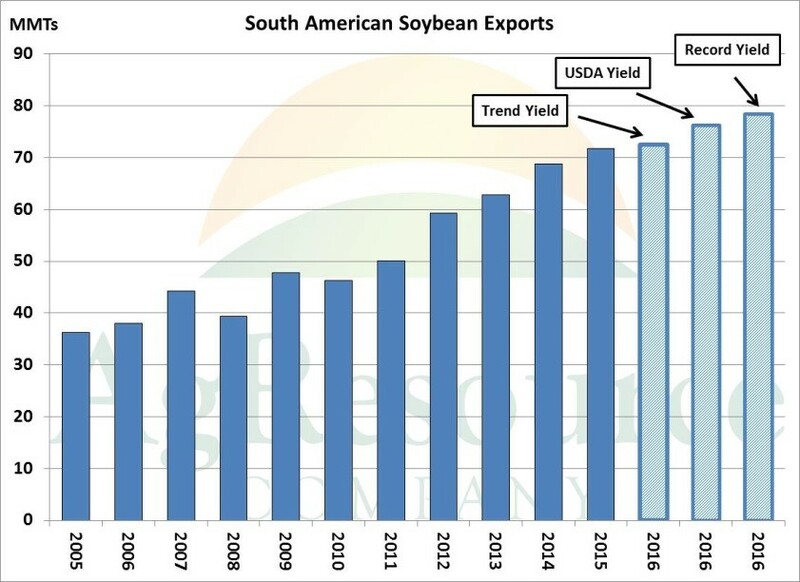 And following last year’s production debacle in South America, the trade is well aware that, despite massive projected US soy supplies, the global price of soybeans will be a function of South America’s exportable surplus, and whether it’s higher or lower than a year ago. The graphic above displays 30-day percent of normal rainfall, and problem areas are highlighted. It’s been far too dry in Northeastern Brazil and far Southern Argentina, and it’s been much too wet in Central Argentina, where government agencies are already cutting planted acreage. It was assumed just 2-3 weeks ago that South American soybean surpluses would be record large in 2017, and that soybean prices would resume a bearish trend, but now AgResource views the situation as a bit more fluid, to say the least. Of course, it all comes down to final production, which won’t be known for months, but following recent weather hiccups, it’s possible that South America’s exportable surplus will be near last year. The graphic above charts S. American soybean exports assuming trend yield, the USDA’s yield, and assuming 2014’s record yield. Each scenario has very different implications for spring soybean prices. For example, the if S. American bean yield is at trend, soybean exports will rise just fractionally, and in the face of rising Chinese demand, US exports will be a new record in 2017/18. This, more than anything, is why soybean prices are some $2.00/Bu above where they were a year ago despite record production and higher projected US soybean end stocks. 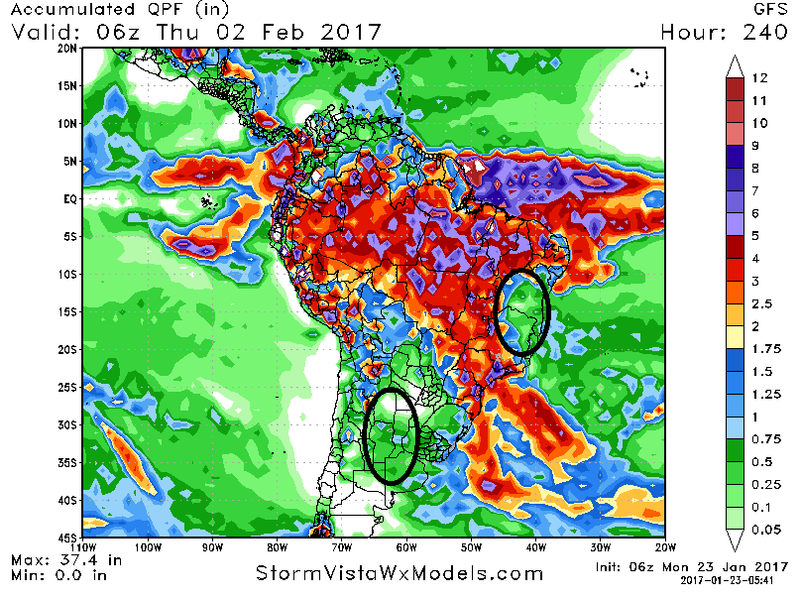 Both higher and lower soybean futures are possible in the next several weeks, and it’s all down to S American weather. 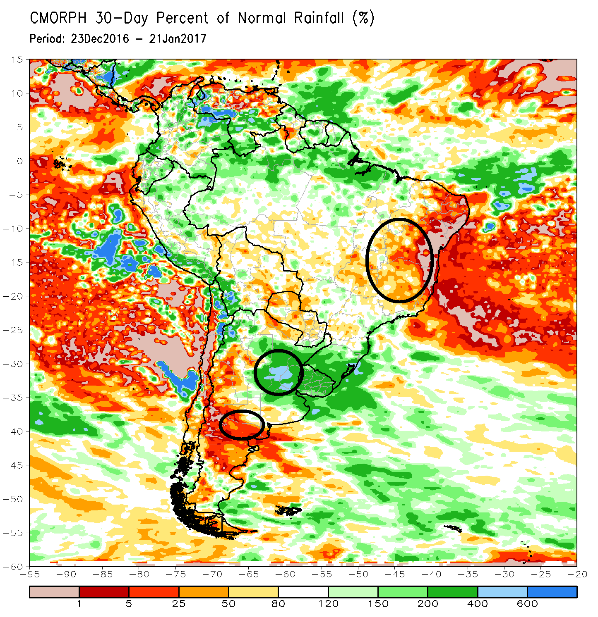 The forecast (below) suggests additional dryness in Southern Argentina and Northeastern Brazil, and so not until harvest data is available will the market have a clear trend. And the market is unlikely to drop much until the latter half of February.